Perennial canker on branches following winter injury. Sample from Hood River. Photo from OSU Extension Plant Pathology Collection. 1956. Perennial canker on this 'Pink Lady' branch. 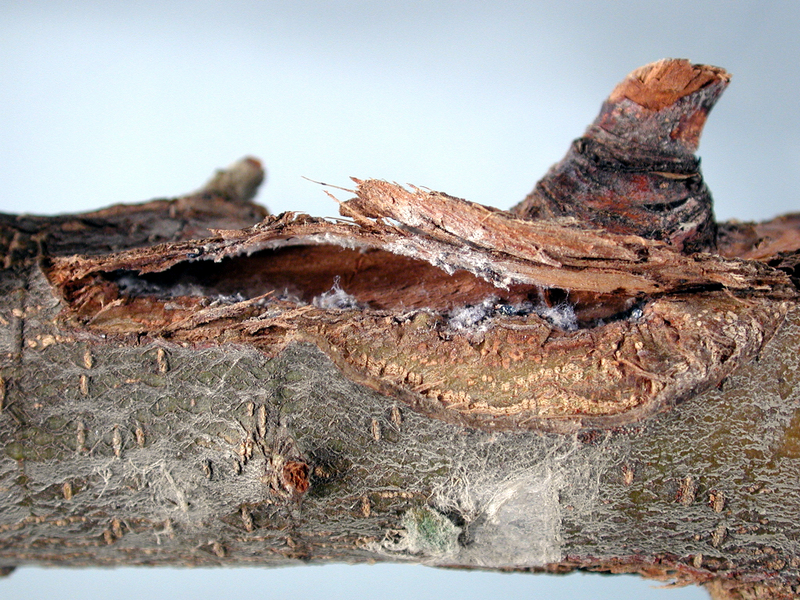 Note the fuzzy white structures of the wooly apple aphid in the cracked area of the bark. Cause Cryptosporiopsis perennans (sexual: Neofabraea perennans), a fungus. The fungus is closely related to that causing anthracnose, and the diseases are somewhat similar. The fungus overwinters in cankers and infected fruit. Conidia are exuded from acervuli and dispersed by rain. Perennial canker; however, is associated with the presence of woolly apple aphids, low temperature or southwest injury, and pruning wounds. The fungus can infect through the wounded portions of the tree. Wooly apple aphids cause wounds each year on the edge of the canker allowing the fungus to reinfect that area. Fruit infection increases 2 weeks before harvest. Other hosts include crabapples, most pome and stone fruit, Amelanchier, hawthorn, and mountain ash. Symptoms On wood-cankers made up of overlapping concentric rings of woody tissue encircling the center wound are characteristic of the disease. Apple anthracnose does not have the concentric rings of woody tissue in the canker. Each ring indicates the disease's progress for 1 year. As the canker enlarges from year to year, it cuts off more of the sap-conducting tissue, reducing the growth and bearing capacity of the tree. Sometimes scaffold limbs are girdled and a large part of the tree killed. 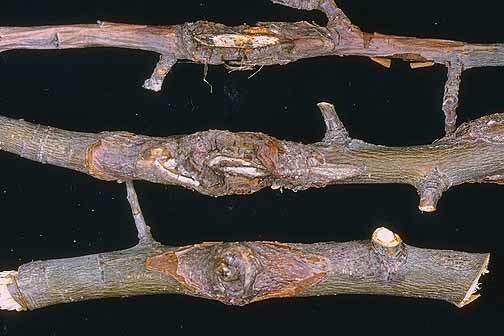 On fruit-the symptoms of the fruit rot, "bull's-eye," phase of the disease are identical to that caused by anthracnose. "Bull's-eye rot" occurs at open lenticels or at breaks in the skin. The rot spots may be only specks, but most of them are 0.5 to 1 inch across by the time the fruit reaches market. Spots may occur singly or be numerous. They may be pale yellowish cream or uniformly brown but are most often brown with a pale center that forms a bull's-eye. Spots are flat to sunken, and rotted tissues are relatively firm. The skin over the surface does not break easily under slight pressure. Rot may be shallow or nearly as deep as wide. In the deeper rots the penetration is more or less U-shaped. Usually, decayed tissues are somewhat mealy and do not separate readily from healthy tissues. Spore-bearing tufts on the causal fungus may or may not be present on the surface of the rot but when present are short, wet, cream colored, and protrude through the skin. Prune out cankers when practical. Harvest apples at the proper stage of maturity. Keep fruit dry after picking and remove from orchard as soon as possible. Avoid wounding trees. If wounds occur, induce rapid healing. Prevent sunscald or southwest injury using white wash of trunks or shields. Chemical control Use as a preventative tactic. Not recommended after the canker phase of this disease has begun. Spray at petal fall and 2 weeks preharvest to control bull's-eye rot. Mancozeb (such as Dithane, Manzate, or Penncozeb) up to 6 lb/A prebloom or at 3 lb/A after bloom. Do not combine the 6 lb/A prebloom or the 3 lb/A all-season schedules. Do not apply within 77 days of harvest. See label restrictions. Group M3 fungicides. 24-hr reentry. SmartFresh (1-MCP) applications shortly after harvest was shown to reduce bull's eye rot on 'Cripps Pink' apples in Italy. Additional information is available on the label. Control woolly apple aphids. See PNW Insect Management Handbook. References Cameldi, I., Neri, F., Ventrucci, D., Ceredi, G., Muzzi, E., and Mari, M. 2016. Influence of Harvest Date on Bull's Eye Rot of 'Cripps Pink' Apple and Control Chemical Strategies. Plant Disease, 100:2287-2293.
de Jong, S.N., Lévesque, C.A., Verkley, G.J.M., Abeln, E.C.A. Rahe, J.E., and Braun, P.G. 2001. Phylogenetic relationships among Neofabraea species causing tree cankers and bull's-eye rot of apple based on DNA sequencing of ITS nuclear rDNA, mitochondrial rDNA, and the β-tubulin gene. Mycological Research 105: 658-669.